The melted cheeses are a typical dish of northern Mexico and of taquerias around the country. It is a dish that when it arrives to the table the cheese is still bubbling because of how hot it is – no one will be able to resist. In this dish interesting things happen as the cheese’s fresh flavor is combined with the mushrooms’ delicate flavor (which complement perfectly well). But also the chorizo’s condimented and spicy flavor comes into place, which gives another dimension to the melted cheese. The melted cheese with chorizo and mushrooms is normally served as entree dish. Although it is so big, so abundant and so nutritious that it can be served as main course . And you will always find some tortillas so it can be enjoyed in the form of a taco or in the form of a quesadilla. This recipe is not complicated, only the chorizo and the mushrooms have to be fried and then everything goes into the oven. It is very important to use some cheese that melts and that has certain consistency like the Chihuahua cheese, the Monterey Jack cheese or the famous Asadero cheese. 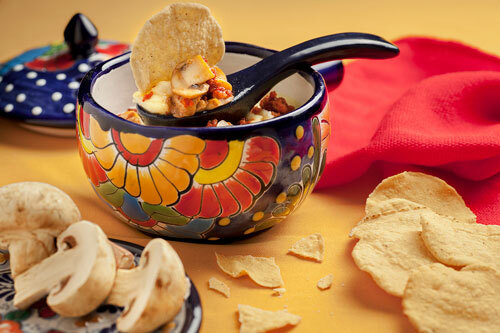 If you have a small clay cazuela, serve in it the melted cheese it will look beautiful and very Mexican. Would you like to prepare homemade chorizo... and use it in the recipe. Preparation time 20 minutes . Recipe for 6 cheese tacos. Finely chop 1/4 of an onion and 1.7 oz of chorizo; then reserve. Clean 3.5 oz of mushrooms and cut them into strips; then reserve. Heat in a frying pan over medium heat 1/2 teaspoon of olive oil. Put in the frying pan the chorizo that was minced and fry it for about 40 seconds, until it releases some of its fat; stir regularly. The strips of the Mushrooms that were cut. Mix the frying pan ingredients and fry them for about 3 minutes, until the chorizo is moderately cooked; stir occasionally. Then set aside. Preheat the oven to 345º F.
Grate 5.2 oz of cheese that melts and put it in a baking dish. The cheese is used grated because it melts faster and the melted cheese acquires a better consistency. Transfer from the frying pan to the baking dish, with a slotted spoon, the ingredients that were fried. Try not to pour the liquid that the mushrooms release over the cheese so your melted cheese has the best consistency. Put in the oven the baking dish and leave the ingredients baking for about 10 minutes, until the cheese has melted. Heat on a griddle over medium heat 6 flour tortillas for about 45 seconds per each side, until they are well heated. Transfer from the griddle to a tortilla container the tortillas that were heated and take it to the table. Verify that the cheese that was left baking has melted, if not leave it baking for a longer time. Sometimes some fat accumulates on the cheese surface, if this happens to you remove it. Tip: If the melted cheese is going to be served as entree, accompany it with some tortilla chips and a delicious Mexican salsa. Did you like the Melted Cheese? This is the “Chihuahua Cheese" that you can use to make the melted cheese. The taste and consistency of your melted cheese will be perfect. You can bake perfectly well the cheese in the “CorningWare Baking Dish" because it is resistant and it has an ideal size. Use a colorful and fun tortilla container to bring joy to your table. Moreover your tortillas will remain warm and soft for a longer time.